I recently updated my Eagles Gallery on my website and made it one of the featured galleries for the month of March. 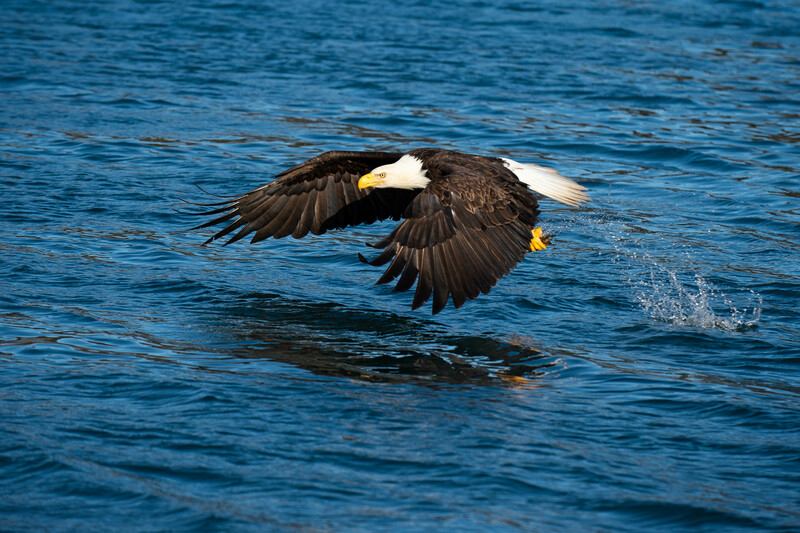 The images in this gallery were taken on a trip to the Kenai Peninsula in Alaska. Many of these flight photos were taken from a moving boat. The challenge was hand holding a large camera since a tripod was useless while the boat rocked on the water. Thankfully, our guides got us close enough to the Eagles that I could use a standard telephoto lens and not my big 600mm. Making my gear a little more lighter really allowed me to use good hand holding technique and capture these birds in flight using a fast shutter speed. Shutter speeds basically have two functions. Slowing the speed can be used to illustrate action as the subject would be blurred. Great for shooting waterfalls in getting that smooth look on the falls. The other function is illustrated with these flight photos and that is to freeze the action with a fast shutter speed. This function is also useful if you have children in sports. Whether it be soccer, football, basketball, or even volleyball, speeding up your camera’s shutter speed is necessary to capture all the action on the field or on the court. Use the warm up time for your team to practice your hand holding technique so when the action starts you can be ready. A great lesson on good technique in order to reduce blurred photos is on line at the Photography Life website and you can find it right here. As the weather starts to get warmer, now would be a good time to get your gear in shape. Make sure your firmware is up to date. Clean your lenses and don’t forget to vacuum out your gear bag as they have a tendency to gather a lot of dust which always seems to gravitate to your digital sensors. Practice a few of these hand holding techniques and be ready. I will see you in the field. Enjoy!